Bits & Scraps Of My Life: LMLC # !09 My Hometown! LMLC # !09 My Hometown! Now, I am about to confess something here.......I'm originally a yankee girl. Yup it's true!!! From wayyyyyyy up north in Louisville, Ky!! LOL...Ok, so it's not wayyyyyyyyyyyyyy up north. But my new home is Knoxville Tennessee. So it's pretty north compared to here.....lol. I was born and raised in Louisville, Ky and lived there until I turned 18 and had sense enough to leave home....lol. I went to work in radio and have pretty much lived in every corner of the state of Kentucky. I don't really miss Ky much, I LOVE it here in Knoxville and seriously doubt I will ever move back to my hometown.. Knoxville is just so much more at ease and laid back and people don't look atcha like you ahve a 3rd eyeball in the middle of your head or like you are gonna mug em if you wave or say hello. And since I never learned to NOT talk to strangers, where I live now is a much better fit....lol.. But there are some really cool things about Louisville, don't get me wrong!! The Louisville Slugger baseball bat is made in Louisville. They have a factory and museum there with the worlds largest baseball bat (yup it's in Guinness!!) sitting right atop the building! They have a super cool waterfront sitting on the Ohio River with fountains for kids to play in and you can watch the boats go buy.....just don't eat anything you happen to catch in the water! There is a working steam boat called The Belle Of Louisville and of course Churchill Downs and the Ky Derby!! For an entire week the city turns into a party town.....each day of the Ky Derby Festival there is an event of some kind goin on leading up to the big race. I still miss that week each year! One of the about Louisville that always struck me as odd growing up is how no one can agree how to pronounce the city's name......LOL. I'm sure this is pretty common everywhere!! But if you are a Louisvillain you can pretty uch figure out where someone is from by the way they say "Louisville" . It is one of the world's great debates......lol. So that is what my layout conetrates on........and the title....haha!!!! How Damn Hard Is It To Say Louisville???? 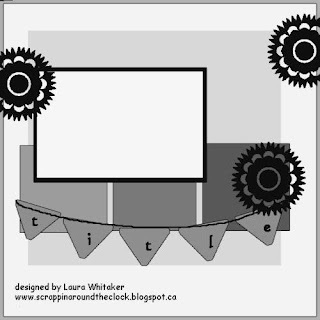 I used this sketch by Laura Whitiaker, which was a blueprint challenge at Colorful Creations that I never got around to doing. 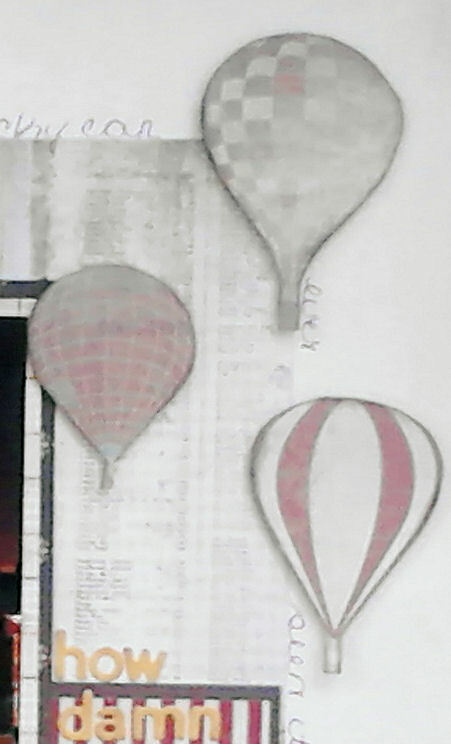 It's a little hard to see my papers and journaling..........I used some goodies from Kaisercraft and fussy cut the hot air balloons. I chose balloons because i am loving the balloon trend right now and the balloon race is part of the Kentucky Derby Festival as well. 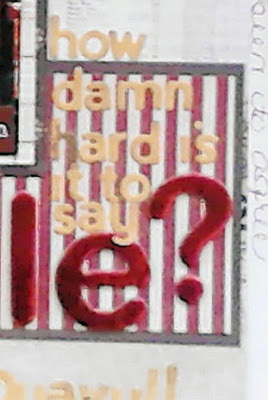 I used letters from Thickers, Jillibean Soup, and MLS. At the bottom I have all of the different ways people say Louisville. . And it is really funny, cuz there is a Louisville in TN as well....but they pronounce it LEWIS-VILLE. Which where I am from is a huge no-no.......lol.. So is there something super cool about your hometown that you'd love to share? Have fond memories of growing up there? Or maybe you have adopted a new hometown.....regardless, that's the challenge this week!!! And we are still lookin for a GDT for November so if you are interested be sure to add GDT to your name when you link up!! Thanks for visiting me today! Be sure to drop by the rest of the teams blogs and see what they have cooked up for you! Have a great day!! Tina love your LO. I Love the picture of the city at night, I've been lucky that I was able to see this twice. Most of the time I'm there during the day. Thanks for sharing. okay... so this is how I say it... Luuueeee ville. (Forget that S) right?? I thoroughly enjoyed reading your post. I had to go to Cincy in 2004 for a training... and realized when I got there just how close to Kentucky I was. I saw that river boat. 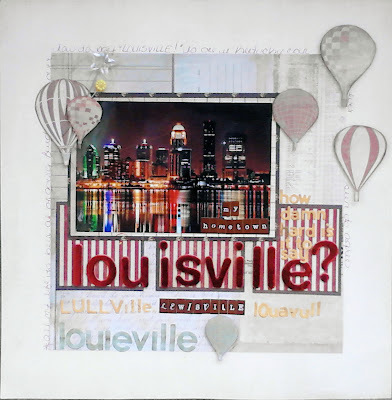 :) Ok.. back to your layout.. that is one gorgeous photo, I am lovin' the hot air balloons and your idea for all the Louisville words is magnificent. Enjoyed this all around!!! Beautiful layout of Louisville. I love how the center is bright and colorful and then the sides are muted and soft. Really cool look. Firstly Tina, that photo is STUNNING!! Ok,so how DO you pronounce it? LOL! "LouYville" or "LouiSville" or am I wrong on both?? LOL!! Love this photo and your little story too. We bypass this on I-75 when we head south. The mountains out there are stunning. So pretty to see the actual town though! TFS, Tina! The s is silent, lol! Great linguistics and history lesson. 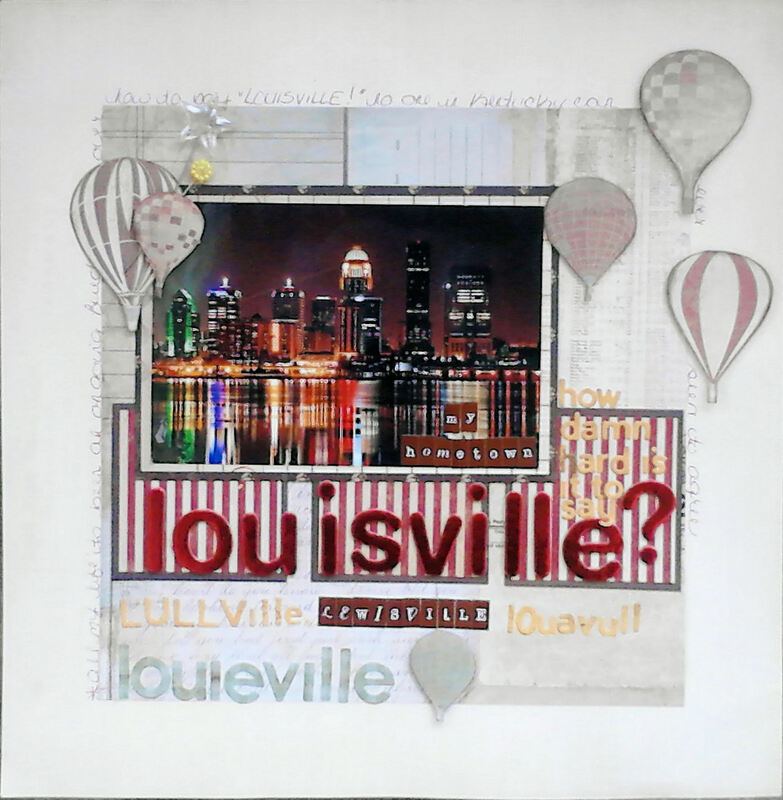 We used to live in a little town by Dayton OH, so I have spent a ton of time in Louisville, the kids loved it there. I have a layout of eating at Joe's Crabshack on the river.